A successful first half of 2014 that saw Alex Manly claim the Australian junior individual pursuit title, Oceania road time trial title as well as the individual and team pursuit double at the Junior Track World Championships was just the start of things to come. With only a quick break Manly was off to Belgium to prepare for the Road World Championships. In her first professional race while still a junior Manly finished 26th at the Lotto Belisol Belgium Tour. After claiming the bronze medal in 2013 in the junior time trial Manly was a favourite to claim gold this year. A rainy day faced the riders and as the last starter Manly took the worst of the rain and went on to finish an agonising fourth, less than a second off bronze. Putting aside the disappointment Manly finished in the front group in the road race. With National, Oceania and World titles in 2014 Manly earned herself a contract with top professional team Orica-AIS. Below Manly talks her road worlds experience and signing with Orica-AIS. PelotonWatch: It has been a very successful year for you. How would you describe it? Alex Manly: It's been a bit of a crazy roller coaster ride that's gone by very fast! I started the year off as a roadie but now I guess I am both a track and road rider. I have had ups and downs, travelled the world, faced new challenges, learnt and experienced so much this year. I am very grateful. PW: You only had a couple of weeks break after Junior Track Worlds before heading to Europe to prepare for the Road World Championships. A pretty quick turn around how did you handle it? AM: It was hard to mentally prepare for road worlds after having an amazing time in Korea. I had a bit of time off to take things in and refresh myself for the next trip. I then had to put my rainbow jerseys away and get back into business very quickly. We had a week in Australia before we left for Belgium. Handling it came down to the great support I had from home, SASI and our little crew in Belgium. It also made it easier knowing that Macey was in the same boat, we were able to help motivate and reassure each other. PW: You spent the weeks ahead of Worlds riding kermesses in Belgium. How important are these for your development? AM: They are great for team bonding and learning tactics to implement at the worlds. The experience will stay with us throughout our cycling careers. The bonding helped Macey Stewart, Anna-Leeza Hull and I to fill 3 of the top 4 places in the world ITT. PW: Your final preparation was the Lotto Belisol Belgium Tour. What was it like riding with some of the best in the world including names like Vos and Johansson? AM: It's insane. I look up to Vos and Johansson and riding next to them in the peloton was very cool. It was an amazing experience and I learnt some very valuable lessons. PW: You finished 26th overall as a junior in an elite race against many of the worlds best. Were you happy with your performance? AM: I was really happy, I made a few mistakes so finishing 26th was a good confidence boost going into worlds. I was able to believe the road legs were coming back! Just in time! PW: Moving on to the World Championships. After claiming bronze in the time trial and top 10 in the road race last year what were you hoping for going in? AM: I had set personal goals to finish at one place better in both events. From last year's experience I knew going into the races that the Australians had a really good shot of doing well. We have the best coaches and support you could ask for. Were in good form and knew the course well. It was just left to race day. PW: You missed a medal in the time trial by less than a second. How disappointing was it? AM: I was very overwhelmed at first. It wasn't the best day for me but I learnt a lot. The day started off overcast and slowly the weather conditions turned bad. I was last off and by the time I was about to race the rain had gotten very heavy. As I was called up onto the start line with one minute before my race, I looked over to see Donna [Donna Rae-Szalinski - junior women's coach] waving frantically at me. She was supposed to be in my follow car so I wasn't sure what had happened. Confused I went over to find out my race radio had died, this meant I wasn't going to get any information the whole race. Mentally I didn't overcome this properly until 10 minutes into the race, where I turned my frustration into motivation. Things that you can't control go wrong. Part of being an athlete is learning how to deal with setbacks and unexpected issues at critical moments. I didn't cope great after the time trial and was gutted but looking back on the day I see the positives, I have been able to grow a lot from the experience and it's certainly helped with character building. PW: In the road race you were in the mix all day. Finishing in the front group in 11th. Were you happy with your ride? AM: I was happy and excited to finish in the winning bunch, but once again a little disappointed as I didn't achieve my goal. The first few laps I think as a team we rode very well, we kept to our roles and did what we had planned. I made a few mistakes in the critical pointy end of the race. But once again I've learned more lessons that are only going to help me in the future. PW: In your first 3km individual pursuit at the South Australian State Championships you rode a 3:37. Happy posting such a competitive time in your first 3km IP? AM: Going into the race I had no idea what to expect. Jason Niblett (my coach) had a really good idea of where I was at and set me on a time that I am still yet to find out. I trust that he knows how to get the best out of me and it worked. I went out a little too hard and couldn't find a rhythm, but am really happy as it was my first one and has set me up well for omnium nationals. PW: It was announced at the start of the month you have signed with Orica-AIS for 2015. Must be exciting to move from the junior ranks in to one of the top professional teams? AM: It's a pretty crazy step but one I am looking forward to! I love racing and riding my bike and am very grateful for being given the opportunity to race at professional level. Being the youngest on the team I only expect to develop over the year and to contribute all I can to the girls. PW: How did the contract come about? AM: It took a lot of planning from the CA coaches and staff. They believe this opportunity will best help us (Macey and I) develop as riders. We were lucky to be pulling off a few results in the right place at the right time. PW: What are you looking forward to most about your first professional road season? AM: The profile of women's cycling is on the rise (thanks to SBS and websites like Peloton Watch) and I am really looking forward to being part of it, travelling to Europe and racing amongst the best in the world. PW: Before then though you still have track season. 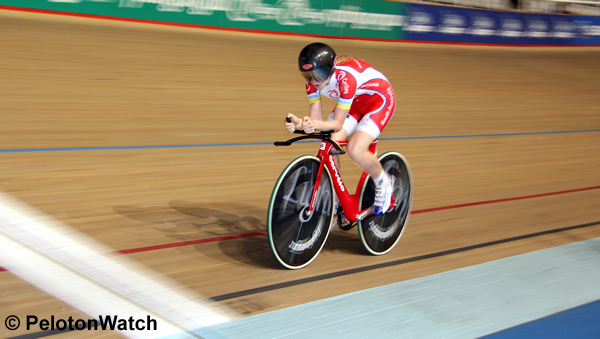 What are you big goals for the remainder of the 2014/15 track season? AM: I am still just going with the flow and seeing where I sit in the elite women's peloton. I haven't set myself any major goals just yet. The National Madison is a great event coming up in Melbourne next week. My Madison partner Danielle McKinnirey and I will give it a real good shot.